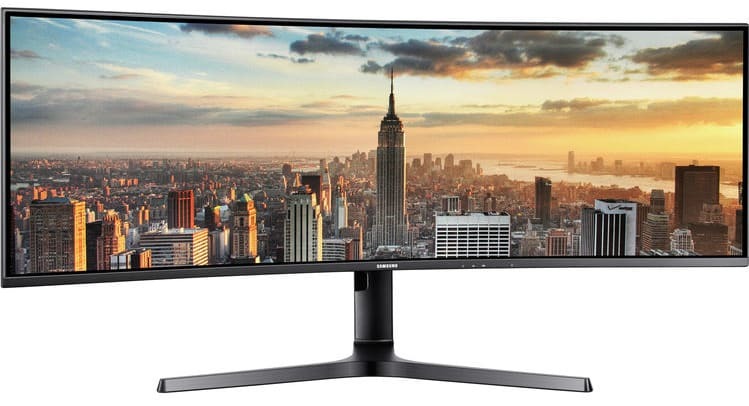 The Samsung C43J890 is a solution for those who want super ultrawide monitors to replace dual screens but have limited desk space. This variant is a smaller spin-off of the upcoming C49J890 which is an upgraded variant of the C49HG90 which stunned the gaming world with its impressively vast screen. What’s great about the Samsung C43J890 is it still offers a screen with a comparable resolution and a faster, 120Hz refresh rate which could possibly make it a viable option than the 49ers. The Samsung C43J890 adopts the series minimalist design which both gamers and reviewers favor instead of gaudy schemes. 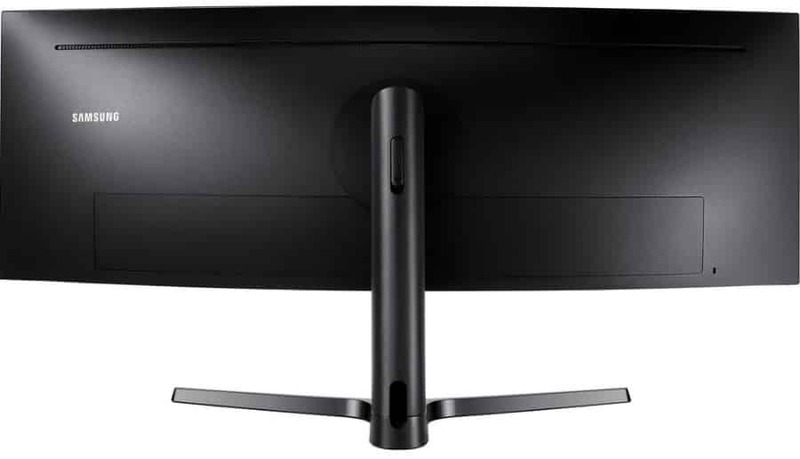 The monitor appears almost bezel-free thanks to the dual-stage borders on the top and sides which are composed of a hard outer layer and a black inner frame. The chassis, like its bigger siblings, will arrive with the brand’s signature blend of charcoal gray which they call dark blue-gray. Samsung’s marketing for their display solutions can be confusing at times, but thankfully, the Samsung C43J890’s aesthetic will fit both gaming rooms and business areas. It also makes the product easier to digest for a wider crowd, since each person has mixed feelings regarding how a device appears up front. What we don’t like in Samsung’s design for these super ultrawides is their omission of the joystick button found in monitors like the CFG70 series. Users are stuck with pressable buttons which are no doubt, of good tactile quality, but unacceptable for a premium monitor. The Samsung C43J890 is designed to be a very capable monitor for both gaming and business applications, so it comes with a rich I/O layout. The panel with a removable plastic cover includes DisplayPort 1.2 and an HDMI 2.0 slot for video inputs, along with four USB 3.0 receptacles for accessories. However, the standout port is the USB-C slot which will allow users to enjoy single cable operation. There is also a pair of 5-Watt speakers which can offer sufficient power for near-field listening. Of course, a cinematic display like this one deserves at least a pair of high-quality studio monitors, but at least you don’t have to spend more cash right away for decent sound. 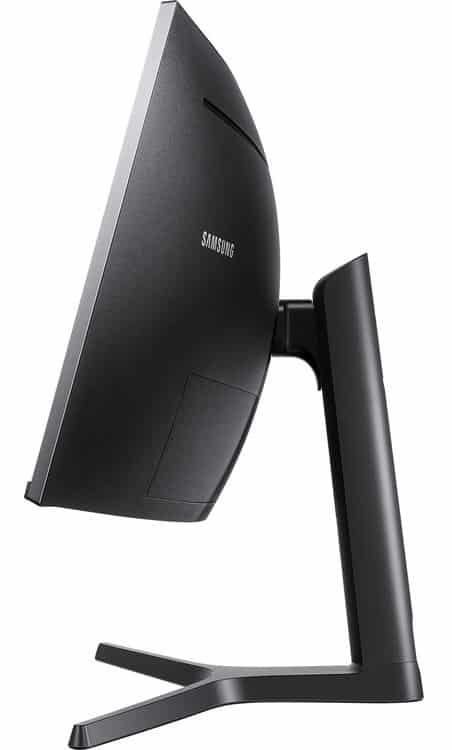 The Samsung C43J890 sports a 43-inch curved VA panel with a 3840 x 1200 resolution, 120Hz refresh rate, and a 5ms response time. The aspect ratio has changed this time to 32:10 instead of the 49er’s 32:9 which gives users extra vertical room in the display space. The monitor’s screen area is similar to two 24-inch 16:10 monitors minus the bezel at the middle, as compared to the 49-inch variants which are identical to dual 27-inch screens side by side. One advantage of the Samsung C43J890 over the larger models is the tighter pixel density of almost 94PPI which is significantly higher than the 49er’s 82PPI. This aspect will give the screen a crisper look with sharper details and cleaner lines. The Samsung C43J890 comes with a 300cd/m2 WLED backlight which, when combined with VA technology and its 3000:1 contrast ratio, will provide amazing colors. Vibrancy is expected to reach or even exceed 100% sRGB gamut volume. The module used also has a true 8-bit color interface for better color performance. What’s strange is that the Samsung C43J890 is a 120Hz monitor, but it doesn’t have common gaming features such as FreeSync. This, along with the 1800r curve form factor make it a perfect solution for enjoying immersive titles or fast-paced racing games. 1ms MPRT, a form of pixel transition overdrive, also wasn’t mentioned in the announcement. The Samsung C43J890 is a welcome addition to an already impressive line of super ultrawide monitors. The new form factor has gained traction in both gaming and business communities since it currently is the most effective alternative to dual displays when horizontal space is considered. The smaller scale of the device will also enable more users to enjoy its benefits since you don’t need an oversized desk to accommodate it. The Samsung C43J890 is already available for pre-order in the USA from select online retailers. The monitor is asking $899.99 at launch, whereas the bigger model can be had for $799.99 at varying market cycles. For the latest prices, updates, and availability dates keep checking this page and the links above and below.